Something has to give today in the College World Series matchup of The University of North Carolina vs. .Louisiana State University. Both teams were pre-tournament favorites and have 114 games between them. North Carolina has not lost back-to-back games all season. LSU has done so only once against South Carolina in late April. Despite all the accomplishments between the two teams, one of the perennial baseball powerhouses will be leaving Omaha without a win. 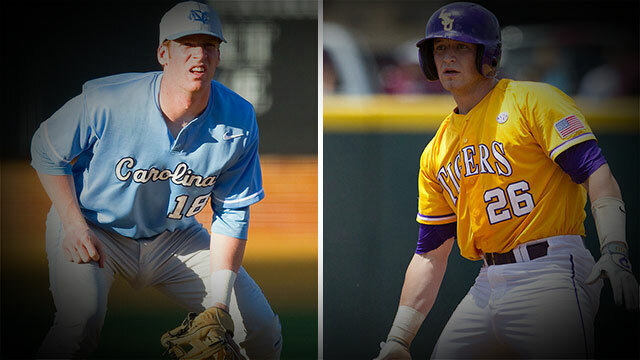 North Carolina fell victim to Carlos Rodon and North Carolina State in their opening round game on Sunday. The Tar Heels looked outmatched in all areas on Sunday afternoon, dropping the Day Two opener 8-1 to their in-state rivals. Freshman Trent Thornton will get to start for North Carolina. Thus far in the NCAA Tournament, Thornton has a 1.20 ERA in 15 innings pitched. North Carolina will be looking for offense and features six hitters in their lineup that hit over .300, including junior Colin Moran .340, freshman Landon Lassiter .360 and freshman Skye Bolt .323. Similarly LSU ran into the stingy pitching of Aaron Nola and the LSU Tigers. Critical defensive miscues proved to be the nail in the coffin for LSU down the stretch, but the Tigers hope to improve their performance today. “I have a lot of respect for North Carolina,” said LSU coach Paul Mainieri. “They have a lot of great players and coaches. They have six left-handers in their lineup and they are. Two great programs but only one gets to go on in the College World Series. Who is your pick? We will have live updates throughout the afternoon so be sure to check back.